Singer, Ego Iheanacho became a known face when she was the lead vocalist of the masked one, Lagabja. She chose to go solo sometime ago and since then, the pretty lady has tried to stand on her own. But it's like the singer is still riding on the back of her former boss as many feel that she is yet to make an impact in the music industry. In a show organised by a multinational company recently, the babe, with her sweet voice, chose to do more of Lagbaja's song. 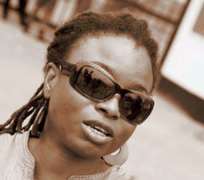 But defending herself during a chat with Life and Beat, Ego said, ”You know I am still an up and coming singer. If I give the crowd my songs just like that, they might not know me any longer and people would break away. You have to carry the crowd along and give them the songs they are conversant with.